Andy King wins PFI 2009 Winter Rotax Junior Championship. Team Adgespeed karting driver Andy King changed back to the Maranello chassis after he was unable to get the best out of the new CRG Dark Knight kart recently tested and made the most of it to take PFI's Junior Rotax winter championship at the final round held today 1st March 2009. Team Adgespeed will now be supplying and selling Maranello karts and parts at various circuits and from the teams headquarters near Manchester. A new event report is now available from the Auto Fix Tour of Epynt Rally. Adgespeed backed Junior Rotax frontrunner Andy King decimated the field at the weekend with an awesome display of driving skills, combined with a perfectly balanced CRG chassis powered by Ogden Motorsport engines. With an 8 minute timed qualifying slot to determine grid positions for the heat it was going to be close with local top runner Jack Marshall in the frame along with other top UK drivers. King had already set the pace in the previous days Saturday practice and had yet again set the benchmark for others, but now it was race day! By lap 5 King was already setting a blistering pace and it was going to be a close call between King and Marshall, pushing as hard as he could gave King pole position for the heat by 2/10ths over Marshall who slotted into grid 2. With a perfect start King drove a faultless 10 lap race to achieve a lights to flag victory by almost 3 seconds. This put King on pole for the 12 lap pre-final which again was dominated by King with another lights to flag faultless drive to give him a massive 6 second win over 2nd place driver Ollie Varney. The pressure was now on King for the 15 lap Grand Final with all eyes on the CRG mounted driver to see if a perfect clean sweep of results could be achieved. With a perfect start it was clear this was going to be a two way battle with local driver Ollie Varney in 2nd place, King led the way until lap 5 when a large water spillage from a two kart collision on the previous lap caught King unaware coming up through Cafe corners blind fast left hander resulting in King going broadside towards the tyre wall and handing the lead over to Varney. King quickly gathered his position and tucked in behind Varney and simply waited until he was ready to take control once again. A brilliant manoeuvre out of the still wet Cafe corner gave King the position he wanted on the final lap and he continued to lead and took a well deserved win by a mere 3/10ths over Varney, a fantastic result to complete a perfect weekends racing. 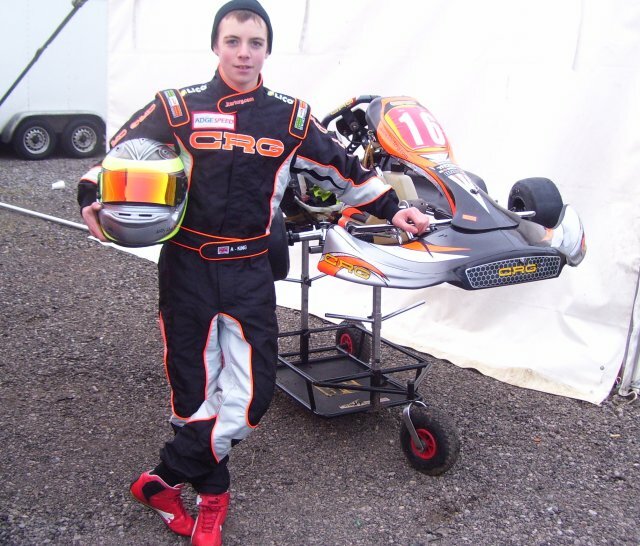 Adgespeed move into Karting and will be running one of the country's top junior Rotax drivers Andy King in various National Championships/Events in 2009. Adgespeed will also become agents for the CRG range of karts and equipment and will be offering event support/parts at many meetings over the year. 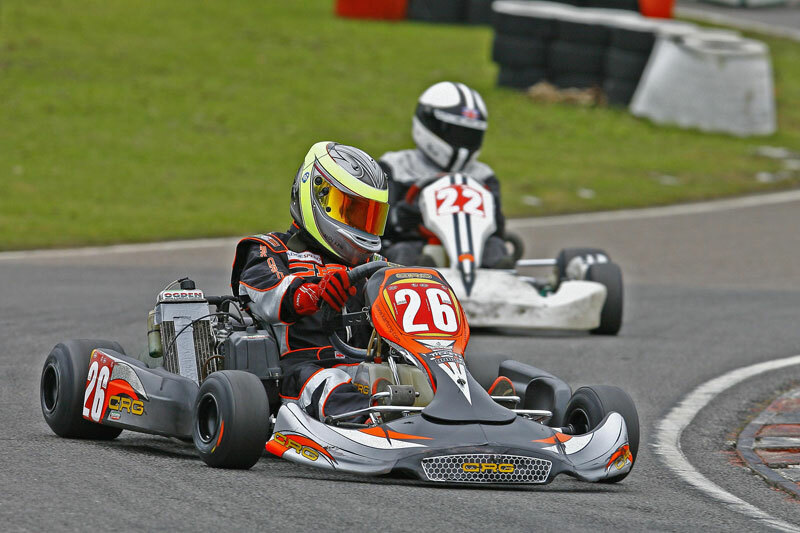 2009 is set to become an exciting year for the team especially with the imminent launch of the new Dark Knight Chassis from CRG which looks to be the Kart to have in 2009. Having teamed up with Andy King the 2006 National Cadet champion and who is currently leading the PFI winter series championship, the team is looking forward to a successful 2009. With the construction of a new car underway and having finished 8th O/A and 1st in Class in 2008 on the MSA Asphalt Rally Championship, the Adgespeed team of Adrian Spencer and Mark Hewitt have decided to compete in the 2009 BTRDA Asphalt Rally Series in order to concentrate on completing the new car, rather than compete in the MSA championship due to the higher costs/time involved. RED Industries Ltd, one of the top UK Waste Management Companies have agreed to sponsor the rally team for a second year and Adrian and Mark would like to thank RED Industries for their continued support. Adrian and Mark will be starting in their current Impreza until the new one is ready, hopefully by April/May. Having won the championship in 2007 the team are hoping to repeat their success in 2009.
with 5 of the 7 events to count. The car is currently being rebuilt ready for the start of the new season with new front CWP/gearbox overhaul and uprated driveshafts after the problems on the Cheviot Rally. Adgespeed are looking to expand their operations into the Karting field and will be running a top Junior Rotax Max karter in 2009. Watch this space for further news. Having won the BTRDA clubman's championship outright last year, Adrian Spencer (Adge) and Mark Hewitt in the RED Industries/Hazwaste Environmental/Adgespeed backed Impreza are looking for a good points scoring run to hopefully win their class and improve on their current 7th position to 6th/5th overall in the MSA National Championship which was the target set at the beginning of the year considering the opposition of WRC and Metro 6R4 rally cars. The Preparation page has been updated with more information about the new car. A new event report is now available from the Mewla Rally. Event reports are now available from both the Jim Clark National Rally and the recent Sligo Stages Rally. Back in stock New Ohlins 3 way adjustable remote canister 50mm Prodrive suspension with bumpy or smooth tarmac settings. More details on the Competition Parts page.